Once you've made up your mind to get a golf cart, you need to decide which type to get. There are motorized carts, pulled carts, and pushed carts. If you don't want to pay the high prices of motorized carts, and if you don't want to exert a lot your arm and shoulder muscles pulling the cart, your best option is to get a pushed golf cart which is normally equipped with either three or four wheels, has good stability, and is ideal for use in particular on flat terrains. Other important points to consider when buying a golf cart is the ease with which it can be folded and stored in your car, the maneuverability of the cart, the amount of storage area available on the cart for your personal belongings such as balls, score cards, bottle of water, umbrella, etc., and the availability of additional accessories that would make your game more pleasant and interesting. The presence of an adjustable handle is also part of the details to consider before your purchase. Indeed, this will allow you to adjust the carriage height to your height, eliminating the need to twist your body or bend every time you need to take something from the bag. Finally, make sure the frame and wheels are strong enough to hold all your golf equipment, which undoubtedly will weigh several pounds. 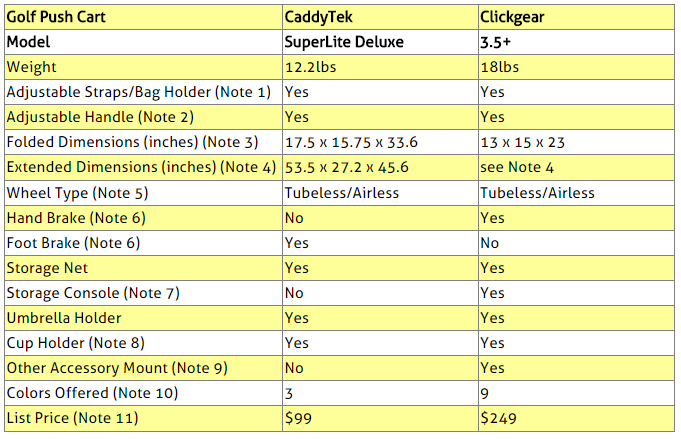 This article will compare CaddyTek SuperLite Deluxe and Clicgear Model 3.5+ push golf carts. Among Amazon customers, these were not just the most popular in their category at the time this article was written, but they have also received excellent reviews from most Amazon buyers. 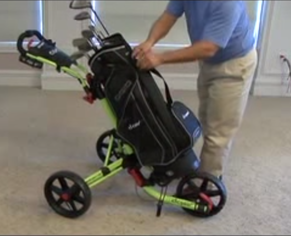 CaddyTek has a patented bag holder that holds a standing bag perfectly and fits all types of bags. Clicgear has easily adjustable straps that will work even with very large bags. CaddyTek has an ergonomic padded and adjustable handle with 4 pushing positions. Clicgear has a handle that can be adjusted to different angles. There is not a particular number of positions it can be adjusted to, because the angle of the push handle will move until the handle is tightened to the position you want. Clicgear does not specify the dimensions for the extended cart. But it is wide enough to be stable (about 24"), and tall enough to be comfortable to push (about 30" at the handle). Tubeless/Airless wheels are practically maintenance free. They increase the reliability of the cart in the long term. CadyTek wheels are made of hard plastic without any tread. Clicgear wheels are wider, have treads and a flatter profile which is better for any golf course in wet conditions. The patented foot brake of CaddyTek SuperLite has a "push to brake and push to release" brake design. The Clicgear 3.5+ hand brake system activates with a lift of the brake lever and is designed to be used as a parking brake. Clicgear 3.5+ is equipped with an large console that includes two scorecard holders, pencil holder, ball holder, tee holder and a Velcro patch to hold your golf glove. The storage console has a magnetic locking lid and is on the handle portion of the cart, right above the storage net. CaddyTek SuperLite has no closed storage console, but has a small fabric storage pouch that is underneath the storage net. The Clicgear cup holder adjusts to different bottle sizes and stays on the cart when folding. CaddyTek is equipped with a bottle holder and umbrella holder. Besides the bottle/cup holder and the umbrella holder, Clicgear is equipped with additional accessory mounts located on the handle of the cart designed to support Clicgear brand of accessories. Clicgear offers 20 unique accessories available to enhance your experience with the cart. CaddyTek comes in the following colors: black, blck-green, black-orange. Clicgrear comes in the following colors: charcoal-black, grey-black, white, white-pink, charcoal-lime, charcoal-yellow, charcoal-orange, white-lime and silver-black. The prices shown are the list prices that were in effect at the time this article was written, and they may have changed. For exact price information, please refer to the Amazon products section below. So which of the two is the right one for you? The tubing material is aircraft grade aluminum. It is heavier and sturdier and can carry heavier golf equipment. It has a handbrake which is easier to manage than a foot brake, specially for older prayers. The tubeless wheels are made of rubber, have treads and better for any golf course in wet conditions. In addition to the storage net, it has a magnetically lockable storage console to keep safely away personal items. Besides the bottle/cup holder and the umbrella holder, there are accessory mounts located on the handle of the cart that are designed to support Clicgear brand of accessories (up to 20 unique accessories are available ). Note also that the Clicgear cup holder adjusts to different bottle sizes and stays on the cart when folding. It provides a much larger choice of colors . 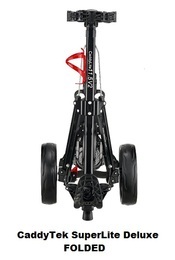 So if price is no issue, we recommend the Clicgear, which is really like the Cadillac of push carts, otherwise you will be quite happy with the CaddyTek as well. You will find below the CaddyTek and Clicgear golf push carts compared above. Please click the golf cart of your choice below for price information or to purchase.